Alessandro Pessot (DT Cycling Team Friuli) soloed to the victory on stage 1 of Carpathian Couriers Race and assumed the overall lead. Italian rider attacked inside the final 6 kilometers from the forming breakaway and managed to hold to his advantage, taking a solo win in Oświęcim. Morocco’s Ahmed Galdoune (Delio Gallina Colosio) brought the peloton home, outsprinting Germany’s Robert Kessler (LKT Brandenburg). “It wasn’t planned. I had good legs and spirits but you never know how the race goes. I’m very happy” – 21-year-old said after the finish. Italian rider, who finished 4th in the prologue yesterday and rode in pink points jersey today, kept his powder dry until the very last kilometers and launched a timed attack to cross the line solo, just ahead of the sprinters. Pessot is now the overall leader and will start the queen stage of 2017 edition with 7 seconds on Robert Kessler, 8 seconds over Tadej Pogacar and 9 seconds over Piotr Konwa. The peloton took off from Nowy Sącz and travelled across undulating terrain of Lesser Poland, climbing 11 hills, four of which were categorized. The stage presented opportunities for both attackers and riders aiming for a select group finish and surviving the ascents on the first 130 kilometers. Racing started on a chilly afternoon with multiple attempts to establish the day’s break. Rog – Ljubljana riders were particularly active – Tadej Pogacar and Ziga Jerman drove early moves, with Pogacar taking first climb and intermediate sprint. Polish National Team and LKT Brandenburg, however, were not interested in letting the break go and shut the move down. After 40 kilometers another Rog Ljubljana rider – Ziga Rucigaj – attacked with Kamil Małecki (Polish National Team), Filippo Tagliani (Delio Gallina Colosio) and Lars van den Berg (Metec-TKH). 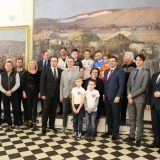 The quartet was later joined by Kristo Prangel (Estonian National Team), Mattia Bais (Team Friuli), Marcin Karbowy (KK Tarnovia Tarnowo Podgórne), Adam Jagieła (TC Chrobry Scott Głogów), Dennis van der Horst (Metec-TKH) and Robert Kessler (LKT Brandenburg), constituting the day’s break. Pragnel was soon dropped on the climb as Rog – Ljubljana and Metec-TKH pushed the pace and quickly extended the lead to 2 minutes. This lasted for next 40 kilometers and only when the Slovenian riders took the points atop the final categorized climb, the gap shrunk to half a minute. The fight was not over yet and hesitation as to the pace making allowed the break to stay away. With the gap hanging around 30 seconds, Piotr Brożyna (Polish National Team) and Tadej Pogacar (Rog – Ljubljana) rolled the dice and made contact, quickly replacing Jagieła and van der Horst, who weren’t up to the pace. The group stayed away until the final 12 kilometers, having spent over a hundred kilometers in front of the race. Bunch sprint looked likely but controlling the group was no easy task and attacks began anew. As one more group managed to gain some ground, Alessandro Pessot gambled and launched an attack for the stage victory. As the crash forced parts of the bunch to reorganize, young Italian pressed on, on the streets of Oświęcim having just enough to hold off the charges and take both the stage win and the leader’s jersey. Ahmed Galdoune sprinted to the second place, beating Kessler, who led his team home. “Today we had a very hard stage with climbs that I don’t feel so good at. My team helped me in the final part of the day and we worked for the win in the sprint. Second place is good and I’m looking forward to the final one as well. My dream is to win” – Moroccan rider said after the decoration. Kessler, who originally never planned to be in the breakaway, ended up being in the leading group and later sprinting for the second place. “I felt really good. I didn’t want to go in the break, I wanted to wait for the sprint. But I saw my teammates struggle a little bit and I knew I have to go because the group was too big. I don’t know if I’m so good tomorrow on the big climbs but I’m looking forward to it” – he said with a big smile. Aggressive day on Polish roads saw Rog – Ljubljana take three jerseys – Ziga Rucigaj assumed the lead in mountains classification, while Pagacar took jerseys for best young rider and best sprinter. “The plan was to go in the break at the beginning. My legs felt very good, so I went for it. I took first GMP, then went for the second one. I knew I was going for the jersey. I had some bad luck later on with a puncture but I made it back” – Rucigaj said after the decoration ceremony. “The others were very tired or just didn’t want to ride with us so we paced the group” – he added. Tomorrow we want to keep the jerseys and attack the yellow jersey. I like climbs but the one tomorrow is not very steep, so sprinters will not be far off. We’ll try to make the race hard” – Pogacar declared.